A money clip is an easy way to hold bills, but what about cards and ID? The money clip wallet does both! 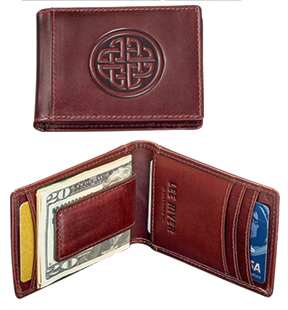 Handsome wallet of vegetable-tanned cowhide has a leather-covered money clip with a powerful magnet, slots for cards and hidden pockets. Outer pockets in front and back. Note - no long pocket for bills. 3" x 4" closed. Handcrafted in Ireland. In brown (as shown) or black.